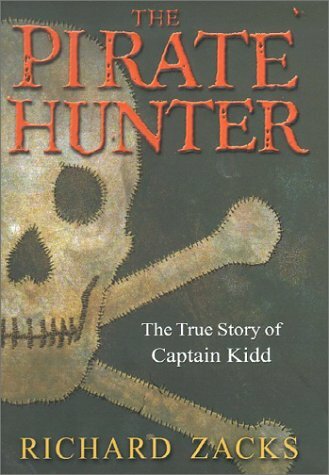 The Pirate Hunter: The True Story of Capatin Kidd by Robert Zacks. ISBN: 0786865334. “The Pirate Hunter” continues this theme. Zacks paints a picture of William Kidd that is unmistakably sympathetic. Kidd, a Scot who settled in early New York and distinguished himself in a naval militia of sorts during a conflict in the Caribbean defending British colonial interests, had parlayed that success into a career as a well-to-do merchant in New York City. He’d married the most beautiful girl in town, helped in the construction of the original Trinity Church building at Wall and Broadway (yes, that church, although the building presently on site was built in the 1850s), and generally had made an important man of himself. Alas for him, the sea and danger called, and he shipped out to London with some idea of obtaining a Royal Navy Captain’s commission in order to fight the dirty French on the bounding main. At that time, however (the 1690s), you had to be a member of the nobility to be an officer in the British military, so he struck out. A shady acquaintance from NYC, who had connections to influential members of the King’s court, hooked up with Kidd, and concocted a scheme whereby Kidd would be granted an unconventional privateer’s license to pursue pirates. A privateer was a means of inexpensively extending a nation’s military power – something like a bounty hunter. Privateers were granted licenses that allowed them to act as agents of military interdiction against specific nationalities, in time of war, or pirates, in time of peace. These licenses generally required the privateers to capture the target and then immediately turn the prize over to the justice system of the day, where the captured goods would be parceled out to interested parties, including, in the case of piracy, the original owners of the pirated goods. Kidd’s license, however, was distinct from the run-of-the-mill licenses in that it was backed directly by the King, rather than by the Navy, a colonial government, or a colonial corporation such as the East india Company. The theoretical advantage was that the goods which Kidd seized did not have to be turned over to the appropriate system of adjudication but were regarded as under the direct control of His Majesty, King William. Given that state of affairs, the King could then assign the goods directly to the backers of the mission. The license turned Kidd into the equivalent of our contemporary drug-interdiction units, who are empowered to confiscate and impound property in association with drug-seizures whether or not there is a conviction in the case. Kidd’s backers stood to profit in direct proportion to the success of the pirates caught. However, things did not go as planned. Kidd had ill luck finding legitimate prizes, and his penurious backers had refused to allow him to pay wages to his crew, insisting instead that they could only be paid from proceeds of the voyage – much like pirate practice, in fact. With this restriction in place, Kidd had a tough time getting any crew but former pirates, and as soon as it was apparent the mission was in trouble, the crew began to agitate to turn pirate. Kidd apparently resisted this strongly, and at one point in the voyage, most of his crew left in order to pursue piracy, with greater succes than Kidd had at privateering. In the end, Kidd took two ships under the rules of his license, but because of a number of unfortunate events, he’d already become the poster boy for notorious piracy on the high seas – not the least of these was the fact that Kidd’s royally-derived grant had become known in Parlaiment and was seized upon as a means of weaking the royalist party. In the end, of course, it was in the political interests of the King and colonial powers to make a great example of this man, whose legend, even before his death, had made his name synonymous with black-hearted teachery and greedy adventure. In the end he was hung, and his body was placed in an iron cage at the edge of the Thames, and left on display for nearly 100 years, as a lesson to those who would turn against the Crown, and now, as a lesson to those who would deal with merciless and corrupt forces that far outweigh them. This is the best pirate history book I have ever read. Zack’s detailed research and clear, unornamented writing allow the complex story to emerge clearly. One gets a distinct sense of the fascination and joy with which Zacks waded through the crabbed, blurred handwriting of his primary source material; as his immersion in the documents increased, his ability to discern, or project, personality into the inky traces left by our ancestors increased, and I came away from the book with a vivid sense of the personalities of many of the players in the book. Zack’s dry, ironic wit helped him, as well, to isolate details which throw his story into relief; and in the book’s closing scenes, as William Kidd is brought to the gallows through the teeming, stinking streets of a Londaon execution day festival, he brings life to his grotesques via vivid, echoing sensory description that brough to mind Borges, Hogarth, and Breughel. An excellent, satisfying read. Arr!